Planning the fix-ups to my daughter-in-law's 1987 Centurion LeMans RS,to improve her comfort and performance for this summer's 200-mile STP and all the fun training rides leading up to it. Working on converting a post WW II lower auxillary pack M-1945 into a saddle bag for a forum member. Lots of leather cutting, edging, punching stitching holes and mental design gymnastics and planning. And more work than I figured, as is usual. But rewarding, creatively. Still playing the waiting game.....I have a c-record wheelset coming from italy(taking forever) a cobalto brake set coming from a couple hundred miles away and taking far too long to get here.... Driving me nuts. I did get my 6 speed regina cx and I must say it is buttery... Building nice stuff takes LOTS of patience. Rrrgh! Well, in the stand right now is an '83 Trek 520 that I picked up the other week. I'm in the process of converting it to 700c, and upgrading a few parts with period-correct Shimano stuff (Deore LX, mostly). I've also got an '89 Specialized Rockhopper Comp that I've just about turned into a Rockcombo clone. I need to replace the rear derailleur and get a longer seatpost, but otherwise, it's pretty much finished. 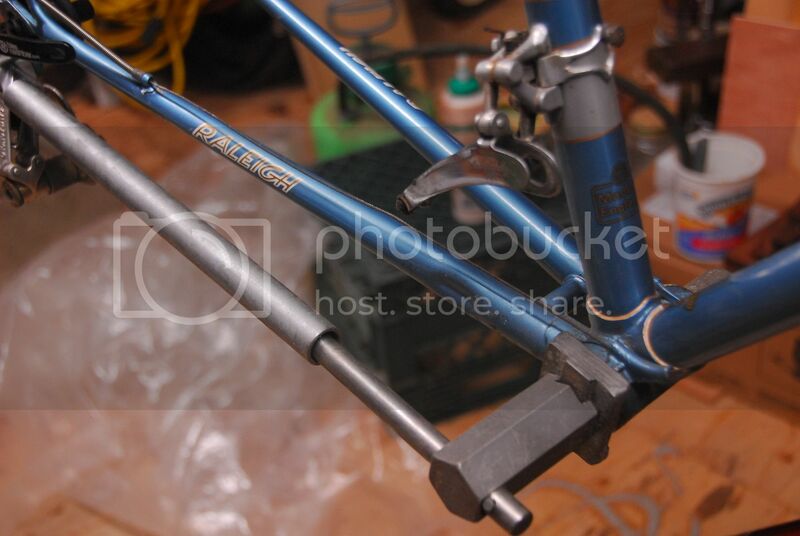 Today I finally got the stubborn fixed cup off of my Zullo frame. I've been fighting it since September. Of course now I remember that I never ordered a new headset and clamp adapter for the front derailleur. Once those are here I can finish installing the 7700 group and find out if I like the frame well enough to keep. I had a visit from Archimedes today, and together we rendered this fixed cup not. not doing it today, but tomorrow afternoon im going to be putting a sealed cartridge bottom bracket, 2x7 speed sti levers and recabling my 1987 specialized sirrus. Wish NOS uniglide cassettes werent so expensive to source these days. I helped a friend strip a nice Carlton Corsa down to the frameset. Before you bellar at me - it was half there already: seat and drivetrain gone and a few other bits and bobs gone. We still have the Nicklin cranks and the W centerpulls and the levers with original white Carlton hoods that cleaned up quite nicely. The fameset is from '69 or '70 with the lamp mount on the front fork leg. Purple (lilac??) with chrome fork socks. I enjoyed cleaning it up. He's going to sell it. Great bike Ed. I didn't realize you had a Mk V. Looks like is was made less than a year after my Mk IV. I can't wait to see it live. Maybe when I come north in the spring. Please start a separate thread on this rebuild. We want more, more. Sir, like all, well at least many of my bikes, this started from my junk box of 30+ years ago. I really don't recollect how I managed to come by the frame set. The crank is a Stronglight that had lived for a bit in my Torpado. The front wheel is in my Team bike, the rear, I think also a Yellow Label Fiamme, is hanging by a flat spot in the floor joists, somewhere. The brakes and derailleurs are Campagnolo, tho the front, as you can see, has had some work done to it. I was curious how things (principally grease) would look after ~35 years of just hanging out. The bottom bracket was a bit stiff, certainly not free-spinning. I can post a photo of one of the cups and the grease (presumably Campagnolo, but certainly a white lithium grease of some sort). It's incredibly gooey, but still appears to be 'greasey', meaning I think it could be put back together and ridden with no harm done. Sir, like all, well at least many of my bikes, this started from my junk box of 30+ years ago. The bottom bracket was a bit stiff, certainly not free-spinning. I can post a photo of one of the cups and the grease (presumably Campagnolo, but certainly a white lithium grease of some sort). It's incredibly gooey, but still appears to be 'greasey', meaning I think it could be put back together and ridden with no harm done. First of all: "Sir" was my Dad, gone under the ground now. And I understand about that grease. I'm pretty sure that the BB on mine had never been touched and "stiff" and "gooey" were compliments. Mine was so stiff the I could not turn the cranks. I could revive it with a bit of WD-40 but that would only last a day then glued to stop again. When I did open the BB I had to dig the old grease out with a knife blade. I could have glued the car to the driveway with the stuff. I wonder if G.O.D.s Worksop boys used tallow from the sheep farm out back there on Eastgate Road? putting back together a 1984 specialized stump jumper after a full overhaul. Was planning on selling it because I'm not into vintage mountain bikes, but it seems it's going to be tough to let go, we will see. Shipping a Bridgestone CB-1 frame. Trip to the city last night to unload about 20 bikes/frames and some misc. Some 27 x 1 1/8 Vittoria Zaffiro tires arrived yesterday for an '83 Raleigh Super Course bike I am fully rehabbing. The plan is to toss those on, run cables, and wrap the bars tonight. Take some pictures tomorrow and up on CL she will go! I can post a photo of one of the cups and the grease (presumably Campagnolo, but certainly a white lithium grease of some sort). It's incredibly gooey, but still appears to be 'greasey', meaning I think it could be put back together and ridden with no harm done. A few decades ago I picked up a small tub of Rampar grease of a light tan color. I have no idea what was in it but it stayed gooey and greasy until I finally used it up two years ago. Any bearings I have ever opened up which I had packed with that stuff were still light and gooey and greasy. I have no doubt that the rest are all still as I last saw them. I've got a late 80s Specialized Rockhopper Comp in my stand right now. Almost completely disassembled. The rusty chain has been soaking in a Bar Keeper's Friend solution and the rust is coming off. Yay! The brass pipe cleaning brushes I ordered should arrive today and I'll get to see if they can tackle the minor inner rust present in a couple spots. End result will be a drop-bar mtb, but right now I'm just cleaning. I'm selling bikes, finally..... Hopefully a couple more tomorrow. On chains (above), when you can buy brand new chain for around $5, unless it is a very special chain, I don't bother with rust removal. New tires, new tubes. Anyone that uses Krylion 23's knows what the "new tubes" thing means. My new to me Witcomb was giving me fits last night. But I think I have everything sorted now. Its a 1969 frame. Its been around a while. The guy I bought it from used a modern group on it. And over the years the BB shell shrunk to 65mm. So the driveline was kinda messed up for my classic build. Shimmed out the BB and that was an improvement. This morning I realigned the rear triangle. Man those 531 tubes are tough to bend. I think I have it all sorted. Gears shift well, wheel sits square in theframe. Now its time to work on the front of the bike. Intall headset and see how the fork lines up. Old bikes need a bit of fettling. I can't wait to see your Rockhopper Comp! Nothing exciting for me. I originally put Kool Stop Continental pads on the '55 Phillips and they were quiet on the steel rims. Now that I've built a new front wheel the brake pads squeal loudly. Really isn't any way to toe in, except maybe bend the calipers, so I'm going to buy the Cane Creek "Grey Matter" pads. A whole bikes worth for less than $10! Filing the holes I drilled last night and then running some wires. Sounds like you have a nice project in the works. What frame are you putting those parts on? Oh man, Masis are my weakness. I'm pretty sure my next vintage bike will be a Gran Criterium. I just finished separating my extra stuff into three piles of goodies: BOC, Ebay and next Sunday's Seattle Bike Swap. I'll be down to the bare bones as regards spare stuff. I'm keeping all my spare small parts (fasteners and whatnot) and a few pieces that are projects (brake levers/crankarm set/a couple seatposts and derailleurs) either to be used or sold.